This year, I'd already had my fill of impossibly delicious apple pie just a couple of days before Thanksgiving, so I decided to mix it up with these yummy cupcakes. I modified the following from the wonderful cookbook Vegan Cupcakes Take Over the World, but this recipe is not vegan. it is just a seriously fantastic cake cookbook for vegans, veggies, and everyone alike. Preheat oven to 350 degrees f, and line muffin pans with papers. Stir pumpkin, oil, sugar, milk, and vanilla together in one bowl, and sift the dry ingredients- flour, baking powder, baking soda, cinnamon, pumpkin pie spice, and salt in a second bowl. Stir both mixes together gently with a spatula or fork. Don't use a hand blender, as it will make the batter gross and gummy, and the cake will be hard and all yuck-city. Fill each cupcake paper about 1/2 to 3/4 full. Bake for 20-24 mins depending on your oven/etc. Check with a toothpick to make sure they are baked through, then cool on a wire rack. Blend together the cream, powdered sugar and vanilla for a very, very long time with an electric mixer until it is very thick and tastes good but maybe a tad too sweet. Add cream cheese and blend even more until it is perfectly smooth and blended and fluffy. Put it in a pastry bag, or pack into a sandwich bag and snip off one corner to create a pastry bag. 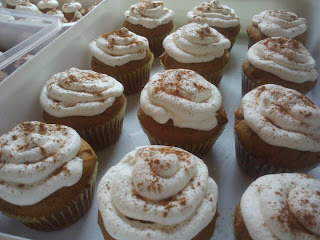 Pipe frosting onto cupcakes once they are completely cool, and sprinkle a little bit of cinnamon on top.